The Saville Life: Baby Saville #1. 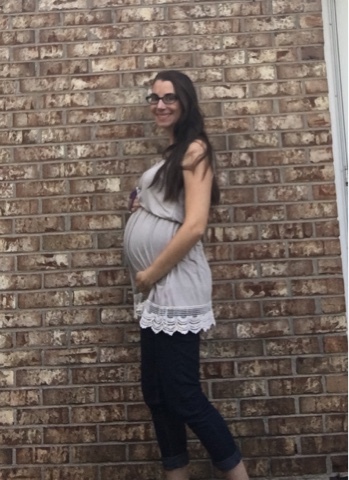 Week 25 Update. Baby Saville #1. Week 25 Update. Sleep: Enjoying lots of naps this week! Haha this mid-summer lull is good for me (or bad 😁). Best moment this week: I had a great doctor's appointment at the end of last week. Eva Kate is measuring well and her heartbeat is right on track. Movement: Yes! Sister is a gymnast. Food cravings: no cravings during this part of pregnancy. Anything making you queasy or sick: Not sick--just indigestion! Have you started to show yet: yes! I'm definitely growing. Wedding rings on or off? Either rocking my Walmart rings or my band from when I worked at CFA. Milestones: Little miss is putting on weight and growing. She is one week from viability. Woah! Major Happenings: doctor's appointment this week was excellent! Scheduled my glucose test and a late term ultrasound to see if Eva Kate has moved from her low position. Many things happening over the next couple of months! What's Been Going On: Feelings-wise, I have felt really good! I still feel quite full of baby and have some back aches, but am grateful for this restful week. Life-wise, this week is odd. Hoping to get some projects done with a bit of free time between the first half of the summer and the second busy upswing coming up!!! Looking Forward To: Working on the nursery and some organization projects this week. Yay! Baby Saville #1. Week 26 Update.